In BluePen Journals, proceedings are the collection of academic papers published in the context of an academic conference. They are usually distributed as printed volumes or in electronic format either before the conference opens or after it has closed. Proceedings contain the contributions made by researchers at the conference. They are the written record of the work that is presented to fellow researchers. The collection of papers is organized by one or more persons, who form the editorial team. The quality of the papers is typically ensured by having external people read the papers before they are accepted in the proceedings. This process is called reviewing. Depending on the level of the conference, this process (including making revisions) can take up to a year. The editors decide the composition of the proceedings, the order of the papers, and produce the preface and possibly other pieces of text. Although most changes in papers occur on the basis of consensus between editors and authors, editors can also single-handedly make changes in papers. Conference proceedings is focused entirely on the publishing of high quality peer-reviewed conference articles. 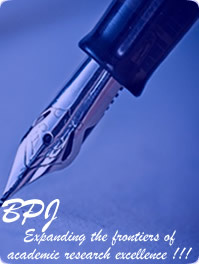 Your papers will be freely available on www.bluepenjournals.org within six weeks of manuscript delivery. Selective articles can embrace all conference content (proceedings, posters, presentations, organization and interest). We currently offer more than 11 titles serving various subject areas including Agricultural Science, Biological Sciences, Environmental Sciences, Educational Research, Energy, Technology, Engineering, Physics, Chemistry, Microbiology and Biotechnology. Access to 90% of global researchers. Your proceedings will be published in a dedicated/special issue on www.bluepenjournals.org open access publisher. Short lead times. We will publish your proceedings online in just 6 weeks; submission and acceptance period. Authors keep full copyright over published articles. Selective collection offers authors and conference organizers a fast and cost effective way to provide maximum exposure for their papers. Special Conference Proceedings issue is a series dedicated to one entity – a conference organizer, a society or a government institute. Conference proceedings are accepted for publication in special issue based on suitability and are required to meet certain criteria, including relevance to an international audience and covering highly cited or timely topics. Conference Proceedings offer authors and conference organizers a fast and cost effective way to provide maximum exposure for their papers. Articles will be published within 6 weeks after submission.